Product prices and availability are accurate as of 2019-04-15 10:51:04 UTC and are subject to change. Any price and availability information displayed on http://www.amazon.com/ at the time of purchase will apply to the purchase of this product. Model Cars is proud to present this #2973 Monogram Kelly Wallace #40 Dirt Devil Pontiac Grand Prix 1/24 Scale Plastic Model Kit by Monogram. Gift this favorite #2973 Monogram Kelly Wallace #40 Dirt Devil Pontiac Grand Prix 1/24 Scale Plastic Model Kit made by Monogram and featured by ModelCars.us. This detailed product is currently available - purchase securely and safely through us today. 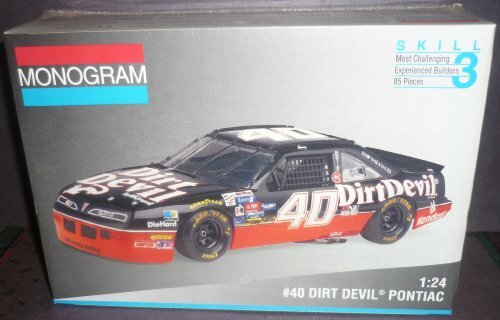 Kenny Wallace #40 Dirt Devil Pontiac Grand Prix 1/24 Scale Plastic Model Kit. Made by Revell/Monogram,marked #2973,1994. Skill Level 3 ,For ages 12 and up Brand New in factory sealed box.